Joanne Sher: Editor/Proofreader : Perfect Picture Book Friday: Elephantantrum! 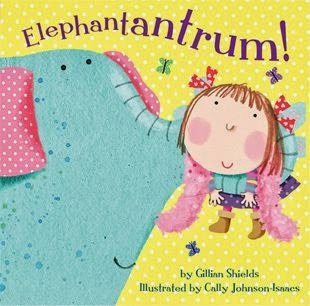 Perfect Picture Book Friday: Elephantantrum! I'm back with another fabulous picture book to add to the lovely Susanna Leonard Hill's Perfect Picture Book Friday project. This one impressed me with a lot of things - but especially how UNdidactic it was considering the "lesson." First Page: Ellie had EVERYTHING. But she wanted more. She wanted an elephant. She wouldn't eat or sleep or brush her hair. She wouldn't smile or play or do her homework. She wouldn't even get out of bed until she got what she wanted. Synopsis: There's tears and tantrums in this humorous picture book about manners when Ellie is tired of playing with her toys. Ellie has everything, but she wants more. She wants an elephant. And she won't eat or sleep or brush her hair until she gets one! But when she finally gets her wish, the elephant decides to teach Ellie a thing or two about manners! Why I LOVE it: It's funny, a little sassy, and extremely clever - and like I said, it teaches a lesson in a totally fun way in a way that is absolutely NOT didactic. And Ellie (and the elephant) are so very relateable! I love the title and the cover -- both very engaging. Can't think of a better way of dealing with selfishness and manners but it a grandiose way -- and elephant. Very clever idea for a book. Oh, some days ... we really need this book. I was sold on the title when I saw the publisher. I really love the recent Tiger Tales books I've found. I hope to find this one at the library. I TOTALLY need this book myself LOL. And yes, Tiger Tales has some fabulous stuff. I DID find this at my library - hope it's at yours, Stacy! I read this book a few months ago and really enjoyed it. So cute! Thanks for sharing it. Sassy sounds good!!! I'll have to check this one out! Thanks! Oooo, I'm with Rhythm ... I like Sassy!! Will be on the lookout for this one. what a wonderful title! I think I've seen one of those elephantantrums happen.